A bear has bitten a visitor at a Chinese drive-through wildlife park where a woman was fatally attacked by tigers last year. 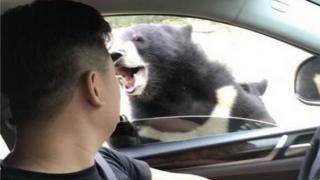 The man had ignored park warnings and rolled down his car window to feed bears at Badaling Wildlife World near Beijing. He escaped with minor injuries, according to local reports. Local authorities have since ordered the park to tighten safety procedures, including limiting visitor numbers. Last year a woman and her mother got out of their car at the park and were mauled by tigers. The mother later died. In the latest incident which took place last Friday, the man, surnamed Chen, was touring the wildlife park with a friend in a car. Despite park warnings, the two men decided to try their luck after seeing other visitors feeding the bears through their car windows without incident, he said in an interview with the Beijing Evening News. A bear went up to their window and Mr Chen tried to roll it up, but the window malfunctioned and rolled down instead. The bear then lunged in and bit Mr Chen's left shoulder. The men sped away and sought medical treatment for Mr Chen. Pictures of the incident, snapped by Mr Chen's friend, have circulated widely online and in Chinese media. Mr Chen told the newspaper: "I admit that I was definitely at fault by opening the window, but at that time I was in a lot of pain and fear, and asked staff what to do. They just told me to go to the hospital by myself, and I was shocked when I heard that." A park spokesman told the newspaper that the incident was due to visitors not observing park rules forbidding the feeding of "wild beasts", which he said were clearly displayed throughout the park. It also released a CCTV video of the incident, which officials said showed park rangers warning Mr Chen to shut his window before the bear attack. Local authorities have since ordered "immediate rectifications" in Badaling Wildlife World, reported the China News portal. This includes improving visitor safety awareness, limiting the number of visitors who drive through the park, and increasing park surveillance.